Deciding to choose ergonomic office furniture over any other is an important consideration assuming that most employees spend at least eight hours a day at work in the sitting position. Back pain is the second largest contributor to work absenteeism, second only to the common cold. When we consider that incorrect posture while seated can cause any number of other problems including fatigue, varicose veins and piles, we can safely say that incorrect posture in the workplace is a major cause of lost man hours and the ergonomic office chair is well worth considering when redecorating your offices or replacing and buying new office furniture. Ergonomic chairs essentially provide comfort by emphasising the natural movements and positions of the body, essentially preventing injury by moving in harmony with the bodies design. A good ergonomic chair should be adjustable vertically allowing the person to sit with their feet flat on the floor. This adjustment should leave the arm rests of a well designed ergonomic chair at desk height. The seat of a well designed ergonomic chair should allow the person to sit with their back up against the seats back rest with the front of the seat a about 5 to 10cm of space between the knees and the seat. Possibly the most important feature of a well designed ergonomic chair is the back support. The base of the spine curves slightly inward naturally and your chair should support the natural curvature of your spine by being adjustable both in height and width. 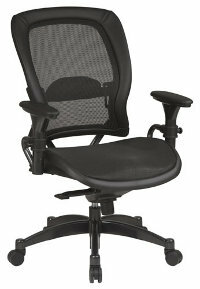 Easy rotation of an ergonomic chair in the seated position is another important feature of an ergonomic chair. The person should be able to manoeuvre the chair easily with simple movement of the feet and arms. Not all ergonomic chairs are terribly expensive and a review of the returns in terms of increased productivity and fewer work days lost can be done very effectively. Deciding to spend a little more on your office furniture by using ergonomically designed chairs and furniture items is well worth discussing with us.